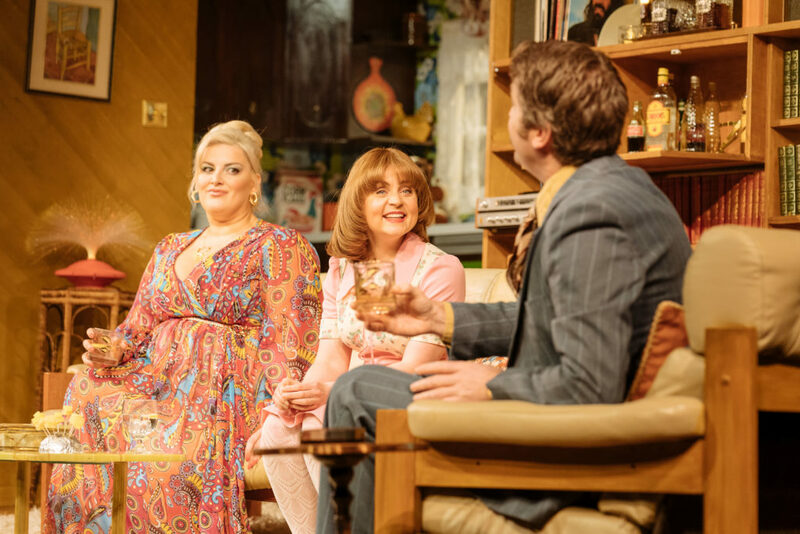 #BrumHour was invited to see Abigail’s Party by The Alexandra. 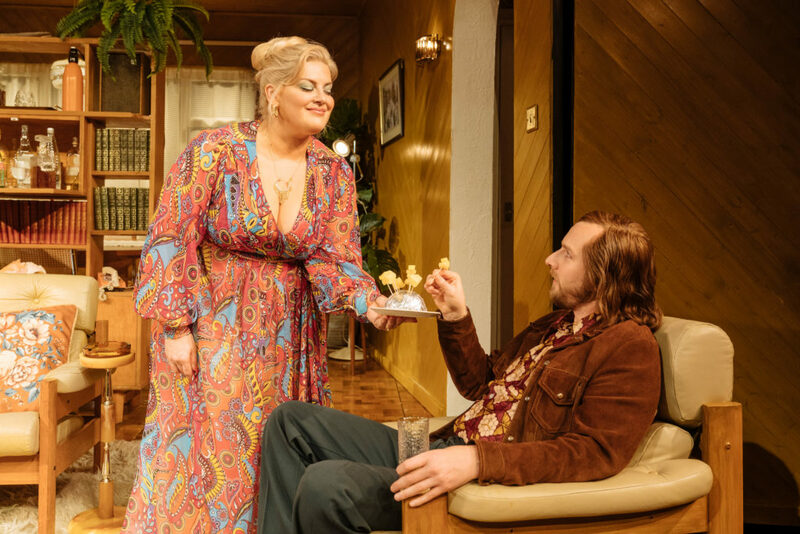 Mike Leigh’s classic play Abigail’s party is at The Alexandra all this week. Set in Suburbia in the mid 1970s, the story is about 5 neighbours coming together for a very awkward cocktail party at the home of Beverly (Jodie Prenger) and Laurence (Daniel Casey). Laurence is an estate agent working himself to an early death, Beverly is a lady who lunches and likes a gin & tonic. Angela (Vicky Binns) and Tony (Calum Callaghan) are keen to meet all their new neighbours. Tony is an ex professional footballer who now works with computers and Angela is a nurse. Finally Sue (Rose Keegan) has come to allow her teenage daughter, Abigail to host her own house party. We never get to meet to titular Abigail. Beverly insists on pouring more drinks every time someone takes a sip from their glass so they are all getting quite rapidly drunk which leads to shameless flirting, a bout of vomiting and some heated arguments. This is more an exercise in people watching. As one astute lady declared last night “it’s like The Royale Family” but it is even more charming as it has aged. The 70s were not the prettiest of decades so the brown florals and the orange accents really does give a lovely sense of the era and I quite enjoyed the nostalgic feel. Jodie Prenger as Beverly is fantastic. 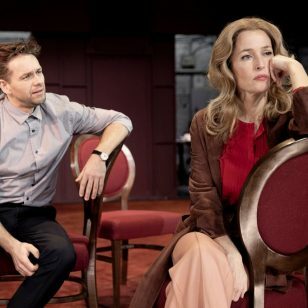 She really gets her teeth into her part as She sashays her way around the stage and her voice is just perfect as she asks her guests “would you like another little drink?” Or “shall we have a little dance” Jodie gives Beverly some real character. Daniel Casey as long suffering Laurence, the snob who looks down on his wife’s love of popular music and popular artist doesn’t say a word when Beverly is flirting outrageously with Tony and Tony is reciprocating. There are moments when this could easily slip into the story of suburbian wife swapping, but nothing that exciting ever happens, and certainly not in Laurence’ comfortable life. As the audience, I just knew that Laurence discusses which route he took when visiting guest and Daniel Casey captures that mediocrity with a perfect performance. 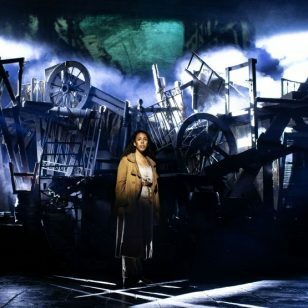 Vicky Binns as slightly awkward Angela, who eventually shines in the final scene again has her character right on pat, she also has the funniest moment on stage, in my opinion when she dances with Laurence. Calum Callaghan as surly Tony, mostly monosyllabic and far from the ideal party guest, struts around as the alpha male of the group. I got the feeling Calum knew someone just like Tony. All the characters are well rounded and I know that is down to Mike Leigh’s writing, but the actors really bring the characters to life. The final guest to arrive is Sue played by Rose Keegan. 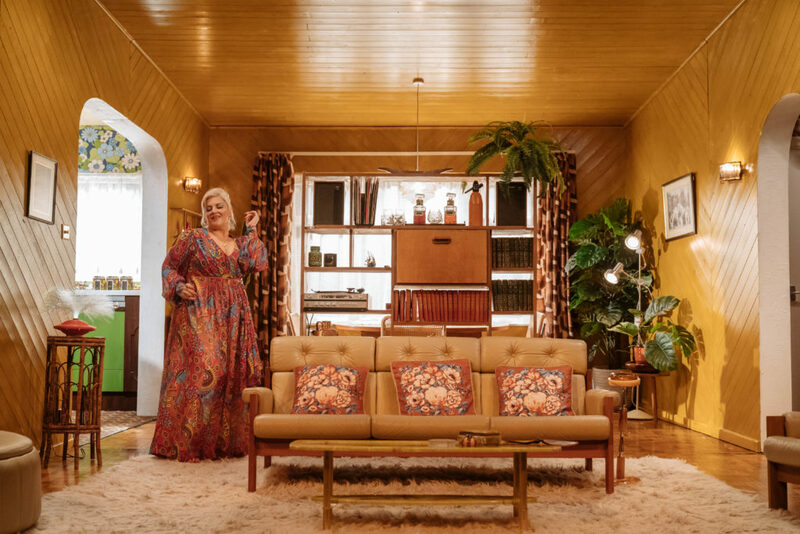 Even without being told Sue somehow conveys that she is cleverer, richer and from a higher social standing, that is the calibre of the acting and writing in this production of Abigail’s Party. The singular set is the comfortable home of Laurence and Beverly, complete with orange soda siphon on the ultra trendy wall unit, brown floral curtains and apparently a rotisserie in the kitchen. 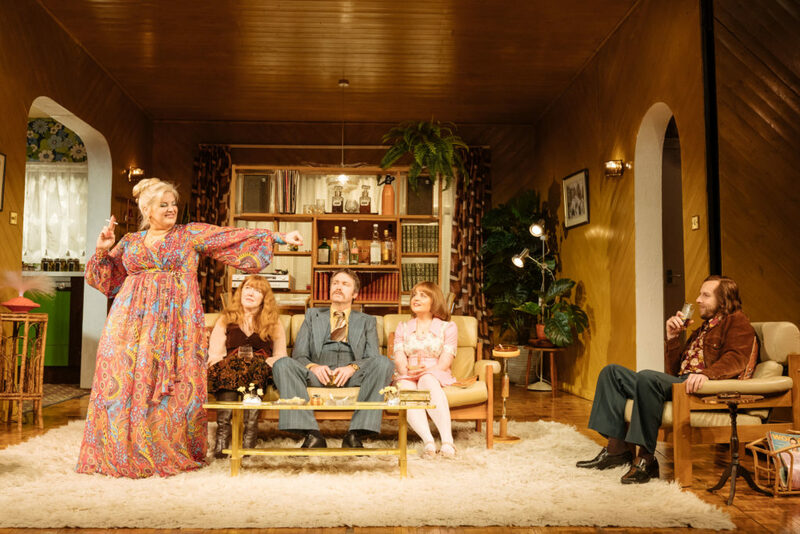 Abigail’s Party is a lovely nostalgic visit back to the 1970s with an absolutely perfect cast. Packed full of laughs but with some real darkness in places this was a wonderful night out.